The Chrysler Cordoba was an intermediate personal luxury coupe sold by Chrysler in North America from 1975–1983. It was the company's first model produced specifically for the personal luxury market and the first Chrysler-branded vehicle that was smaller than full-size. In the early 1960s, when other upmarket brands were expanding into smaller cars with such models as the Mercury Comet and Buick Skylark, Chrysler very publicly declared that there would "never" be a smaller Chrysler. Indeed, the 1963 Chrysler deluxe catalog says of the New Yorker, "This is no jr. edition car." The 1962 deluxe catalog goes even further, proclaiming on the rear cover: "there's not a jr. edition in the whole family!". The Cordoba name was used in the spring of 1970 as a specially trimmed individual model based on the Chrysler Newport hardtop (two-door and four-door). This full-size model was a "limited edition luxury car, designed to introduce you to Chrysler" and consisted of an exclusive "Cordoba Gold" paint with matching wheels, wheel covers, and side molding with vinyl inserts. Chrysler described this model's textured antique gold all-vinyl interior, matching vinyl roof cover, and the hood ornament with an Aztec eagle as "quiet Spanish motif". Included in the $4,241.65 price was the 383 cu in (6.3 L) 290 bhp (220 kW) two-barrel carburetor V8 engine, automatic transmission, power steering, H78x15 fiberglass-belted whitewall tires, and a "golden tone" AM radio. Originally designed by Chrysler to be the all new Plymouth Sebring for 1975 which was to share bodies with the Dodge Charger SE, a decision was made to introduce this car as the first small Chrysler. The smaller Cordoba was introduced as a contender in the personal luxury market that was powered by smaller, more economical engines than other Chryslers, and riding on a 115 in (2,921 mm) wheelbase, 9 in (229 mm) less than the traditional models at the time. This single body style coupe was one of Chrysler's few genuine hits of the 1970s. At a time when the automaker was teetering on bankruptcy, demand for Cordobas actually exceeded supply for its first couple of years, with production of over 150,000 units for the inaugural 1975 models, and the most built in 1977, with 183,000 units. Half of Chrysler division production during this period (and occasionally more) was composed of Cordobas, and they helped to revive the division. All Cordobas were built in Windsor, Ontario. Although Córdoba is the name of a city in Spain, the car's emblem was actually a stylized version of the Argentina cordoba coin. Either way, the implication was Hispanic, and this theme was carried out with somewhat baroque trim inside the vehicle. Although the first spokesperson for the car was Richard Basehart, Chrysler famously secured movie and television actor Ricardo Montalbán as the car's advertising spokesman through its entire run. Notable was his eloquent praise of its "rich Corinthian leather"  interior. 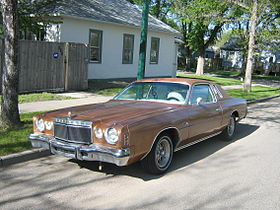 The Cordoba was introduced by Chrysler for the 1975 model year as an upscale personal luxury car, competing with the Oldsmobile Cutlass, Buick Regal, and Mercury Cougar. The Cordoba was originally intended to be a Plymouth—the names Mirada, Premier, Sebring, and Grand Era were associated with the project; all except Grand Era would be used on later Chrysler, Dodge, and Eagle vehicles, though only the Dodge Mirada would be related to the Cordoba. However, losses from the newly introduced full-size C-body models due to the 1973 oil crisis encouraged Chrysler executives to seek higher profits by marketing the model under the more upscale Chrysler brand. Interiors were more luxurious than the Dodge Charger SE and much more than the top-line standard intermediates (Plymouth Fury, Dodge Coronet) with a velour cloth notchback bench seat and folding armrest standard. Optionally available were bucket seats upholstered in Corinthian leather with a center armrest and cushion, or at extra cost, a center console with floor shifter and storage compartment. The dashboard and door panels featured simulated burled elm trim and metal stampings in 1975, while 1976–1979 models featured simulated rosewood trim. A 60/40 bench seat was introduced in 1976 and other seating/upholstery options were added each year through 1979. The original design endured with only small changes for three years before a variety of factors contributed to a decline in sales. For 1978, there was a modest restyling with the then popular rectangular headlights in a stacked configuration (the Dodge Charger SE kept its round headlamps for 1978 rather than rectangular stacked of the Cordoba). A Chrysler designer, Jeffrey Godshall, wrote in Collectible Automobile magazine that this restyling was viewed as "somewhat tacky" and eliminated much of the visual appeal that the 1975 to 1977 Cordobas had been known for. The restyle also made the car appear heavier than its 1975–1977 predecessor at a time when other cars in this class were being downsized to smaller dimensions such as the Ford Thunderbird in 1977 and Chevy Monte Carlo and Pontiac Grand Prix in 1978. The Cordoba's sales decline in 1978 and 1979 could also be attributed to the introduction of the smaller Chrysler LeBaron in mid-1977 that was available in both sedan and coupe models, and offered similar personal-luxury styling and options. Facelifted from the abandoned line was the redesigned Ulu trim, whose aerodynamic exterior featured chrome bumpers, black accenting on the trunk and unique headlights. At the same time, Chrysler's financial position and quality reputation was in steady decline. Rising gas prices and tightening fuel economy standards made the Cordoba's nearly 3,700 lb (1,700 kg) weight with 360 cu in (5.9 L) or 400 cu in (6.6 L) V8 engines obsolete. For 1979 a $2,040 "300" option package was offered on the Cordoba, featuring an all-white exterior, "Chrysler 300"-style grille and a four-barrel 360 V-8 engine. The Cordoba was downsized for the 1980 model year. The smaller, second-generation model used the J-platform dating to the 1976 F-body Plymouth Volaré, along with its rebadged variant, the Dodge Mirada. Chrysler also revived the Imperial for 1981 as a third variant of the J-platform. The Cordoba and Mirada now had a standard six-cylinder engine (the 225 Slant Six) that, while very reliable, did not seem to be suitable power (95 hp) for these slightly upmarket coupes. The much-detuned 318 cu in (5.2 L) 120 hp V8 was an option (standard on the Imperial, with EFI), as was the performance oriented code E58 360 cu in (5.9 L) 185 hp V8, though it would be dropped off the option list for 1981 and on. The 1980 and 1981 LS model (which was originally intended to be the "300") featured an aerodynamic-appearing nosecone (nearly identical to that on the Mirada) with a "crosshair" grille. Other features of this model were the deletion of the vinyl roof cover and a monotone color exterior. The second-generation Cordoba's styling did not attract the praise of the original, and sales were off substantially. The industry downsizing of vehicles also affected the personal luxury models. Both the Chevrolet Monte Carlo in 1978 and the 1980 Ford Thunderbird shrank in size and sales simultaneously. However, those models eventually recovered as their makers moved to correct their cars' flaws, while the smaller Cordoba never did. Chrysler was increasingly concentrating on its compact, front wheel drive models with four and six-cylinder engines, and management stopped producing the Cordoba in 1983. With less than 100 cars equipped with the E58 360 cu in (5.9 L) 185 hp V8, the engine option was discontinued after the 1980 model year due to low demand. Only two engines were available with the Slant-6 being standard and the 318 cu in (5.2 L) V8 optional for the 1981-83 model years. Both the first generation and second generation Cordobas made appearances in NASCAR. Ed Negre campaigned one occasionally in 1979-80 seasons, and Buddy Arrington ran a second generation car in the 1982-84 seasons, alternating with Dodge Miradas and Chrysler Imperials. The Cordoba was no more aerodynamic than the other Mopars and never finished higher than 15th in any race entered. Today the "'Doba", as it is known to its fans, maintains a fairly loyal owner base and some models are considered collectible. The very early production 1975s, particularly with the optional four-barrel carburetor, and the rare Cordoba-based 300 of 1979 are the most valuable. The second generation Cordoba has attracted little interest in the collector market so far. Regarding the 300 version, Consumer Guide said in 2007 "the '79 could become a minor collectible in the distant future, but LS prospects seem slim to non-existent at this time." ^ a b c d "The new Chrysler Cordoba (advertisement)". Ebony. 25 (6): 84–85. April 1970. Retrieved 22 August 2012. ^ a b c Hyde, Charles K. (2003). Riding the Roller Coaster: A History of the Chrysler Corporation. Wayne State University Press. p. 223. ISBN 978-0-8143-3091-3. Retrieved 22 August 2012. ^ Novas, Himilce (2008). Everything you need to know about Latino history: 2008 edition. Penguin Group. pp. 330–33 1. ISBN 978-0-452-28889-8. Retrieved 22 August 2012. ^ Frum, David (2000). How We Got Here : The 70's--The Decade that Brought You Modern Life--For Better or Worse. Basic Books. p. 25. ISBN 978-0-465-04195-4. ^ "1977 Chrysler Cordoba Brochure". Oldcarbrochures.com. p. 6. Retrieved 22 August 2012. ^ "1976 Chrysler Owners Manual". Oldcarbrochures.com. p. 15. Retrieved 22 August 2012. ^ "Dodge Charger Sales and Production". applar.com. Retrieved 27 January 2018. ^ a b "Chrysler Cordoba, Specifications and Dimensions". Archived from the original on 10 April 2005. Retrieved 22 August 2012. ^ a b "1978-1980 Chrysler Cordoba". Moparautos.com. Archived from the original on 16 March 2012. Retrieved 22 August 2012. ^ Auto Editors of Consumer Guide (16 July 2007). "1979-1982 Chrysler Cordoba 300/Cordoba LS". auto.howstuffworks.com. Retrieved 22 August 2012. Wikimedia Commons has media related to Chrysler Cordoba. Vehicles are available as Chrysler only outside US, as Dodge or Plymouth inside US. This page was last edited on 31 March 2019, at 05:18 (UTC).